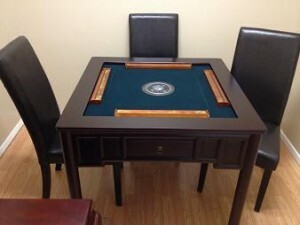 Versatile Machinery’s newest automatic Mahjong tables are one’s specifically designed for the American and Japanese styles of play. The American automatic Mahjong Table includes two sets of 152 tiles with jokers and green and red dragons. The Japanese automatic Mahjong Table features a butterfly-folding-away control center and comes with two sets of tiles with blanks and red 5-replacements. Two sets of tiles allow the table to sort one while the other is being used. The standard models for both have plastic frames and run about $1,400 delivered in the United States. In various wood finishes (some with matching chairs), the price goes up $500-3,000. But hey, no more mixing and stacking! I have one and its great, i love it! So excited cant wait to recieve mine. Been playing with my friend’s table and such an amazing product. Had to get one of my own. Please check our website for the largest selection available of Automatic Mahjong Tables. http://www.versatilemachinery.com Call me or email me with any questions you have.